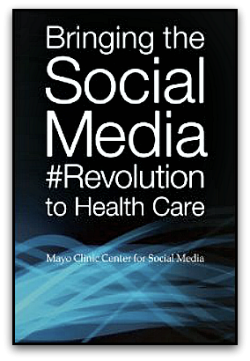 In 2012, The Mayo Clinic Center for Social Media (MCCSM) published Bringing the Social Media Revolution to Health Care, which includes essays from 29 thought leaders, many of whom have served on our MCCSM External Advisory Board. We focused on why and when to issues in health care rather than on technical specifics of these rapidly and ever-changing platforms. As a result, our book remains a useful introduction to strategic and tactical thinking. Bringing the Social Media Revolution to Health Care has helped generate conversations in hospitals and health systems around the world and 7,000+ copies have been sold to date on Amazon, CreateSpace and Kindle. Now, we’re delighted to offer eBook versions (Kindle or PDF) FREE to Basic or Premium members of SMHN. The print version is still available for sale if you find that format more convenient (e.g., for group discussions or gifts), but now you can get it for free and be up-and-reading within minutes. Here's how: Login to your SMHN account (or get your free Basic membership) and then download your copy. Boom! You brought Bringing the Social Media Revolution to Health Care to your screen.